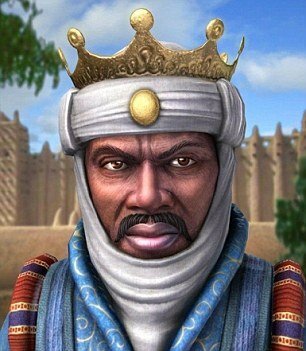 Mansa Musa I of Mali, an obscure king who ruled West Africa in the 14th century, has been named the richest person in history in a new inflation-adjusted list of the world’s 25 wealthiest people of all time. Using the annual 2199.6% rate of inflation, where $100 million in 1913 is equal to $2.299.63 billion in 2012, Celebrity Net Worth’s list includes familiar names like Bill Gates and Warren Buffett; but sitting at number one is Mansa Musa I of Mali. The Rothschild family, second on the list, are the richest people on earth today with assets that total at least $350 billion – their wealth divided amongst mining, banks, private asset management, mixed farming, wine, and charities. Meanwhile John D. Rockefeller, third on the list, is the richest American to have ever lived, worth $340 billion in today’s USD at the time of his death in 1937. In comparison, the poorest man on the list is 82-year-old Warren Buffett, who at his peak net worth, before he started giving his fortune to charity, was $64 billion. Mansa Musa I, the richest person in history, had a personal net worth of $400b illion at the time of his death in 1331. Born in 1280, Mansa Musa I ruled West Africa’s Malian Empire which covered modern day Ghana, Timbuktu and Mali. According to the writings of Arab-Egyptian scholar Al-Umari, Mansa Musa I inherited his throne through a practice of appointing a deputy after the king goes on his pilgrimage to Mecca; later naming the deputy as heir. Just two generations after his death, however, Musa’s world record net worth was diminished after his heirs were not able to fend off civil war and invading conquerors.